Red Flag Warning in effect tonight at 11pm through 6am Wednesday. PDT Wednesday. The Fire Weather Watch is no longer in effect. little or no humidity recovery Tuesday night. county line. Areas around Mt Saint Helena and Mt Tamalpais. 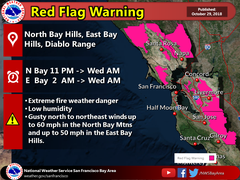 Extra precautions should be taken druing Red Flag Warning events. Monitor local news for updates on weather and any local fires. Do not use powered equipment in or near dry vegetation. Immediately report any smoke or fire by calling 911.